Start-up life is the stuff of legends. Garages. Angel investors. Sleepless nights and profitless years. Romanticized by outsiders and barely survived by the actual innovators. Start-up life isn’t for everyone. All too often, the people with the ideas don’t have the money to commercialize them, and the people with the money don’t always have the time or energy to come up with the ideas. But at Tech Center, we want to innovate the way the world innovates. 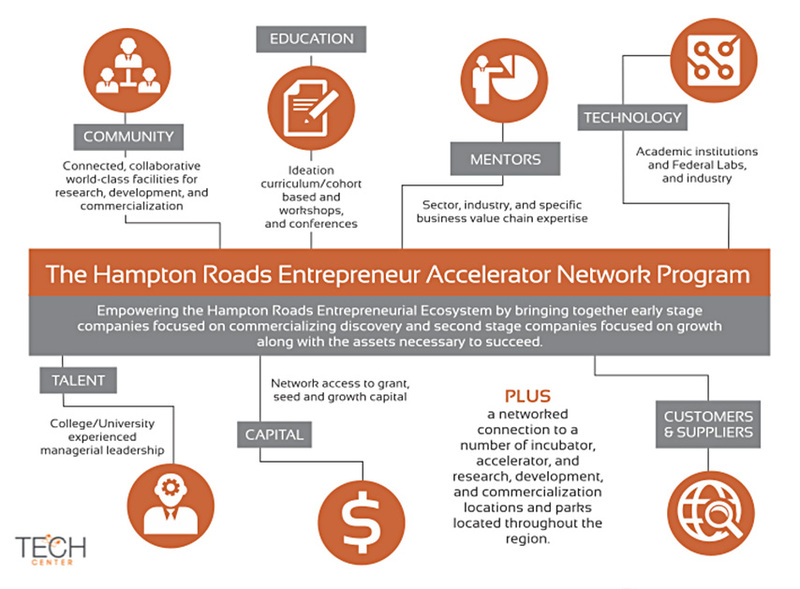 Years in the making, our Accelerator Network aims to create a symbiotic relationship between innovators and the companies that desperately need innovation. Members of the program have unrestricted access to leading resources across the globe: from mentorships to continuing education, ideation curriculums to cohort-based workshops, academic labs, top talent, world-leading technologies, connected community and, of course, capital. You also gain access to VT KnowledgeWorks, the extraordinary business-building program from the renowned Virginia Tech Corporate Research Center who helps companies of all sizes plan, launch and grow. The Tech Center Accelerator Network creates a culture of encouragement and drive. And it spells the difference between what could have been and what will be.